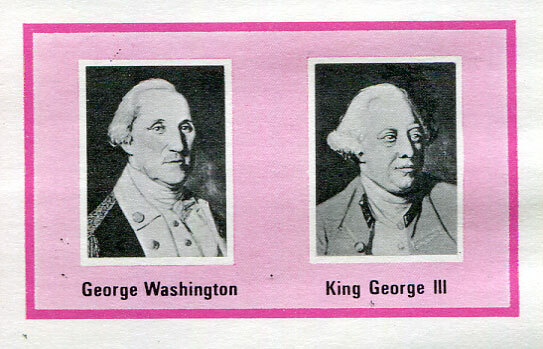 1975 $2.50 Carnival booklet printed WITHOUT THE 35c denomination but including a SECOND 25c BY ERROR (the four panes adding up to only $2.40 instead of the intended $2.50). A great modern rarity in perfect unmounted mint condition. The booklet was assembled by the St. Vincent Philatelic Bureau staff (126 girls at its peak in 1978). At a very late stage of collation and early stapling it was noticed there was no 35c value. A corrected pane was rapidly sent from the printers in Holland but some error booklets had already got into the standing order supply chain. The expectation was that no more than about 10 error booklets were in circulation and most have not been found to this date. 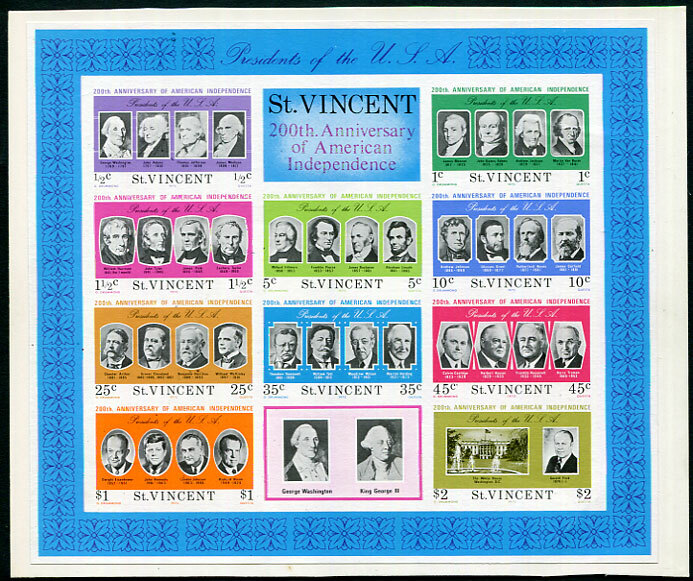 1975 200th Anniversary of American Independence issue: Two differing mint imperforate proof sheets exist (this one having DARKER PINK BACKGROUND TO LOWER MIDDLE LABEL than found on the issued stamps, the reason unknown) showing wrong portrait of Franklin Pierce on the 5c, and wrong portrait of Andrew Johnson on the 10c (transposed portraits error). 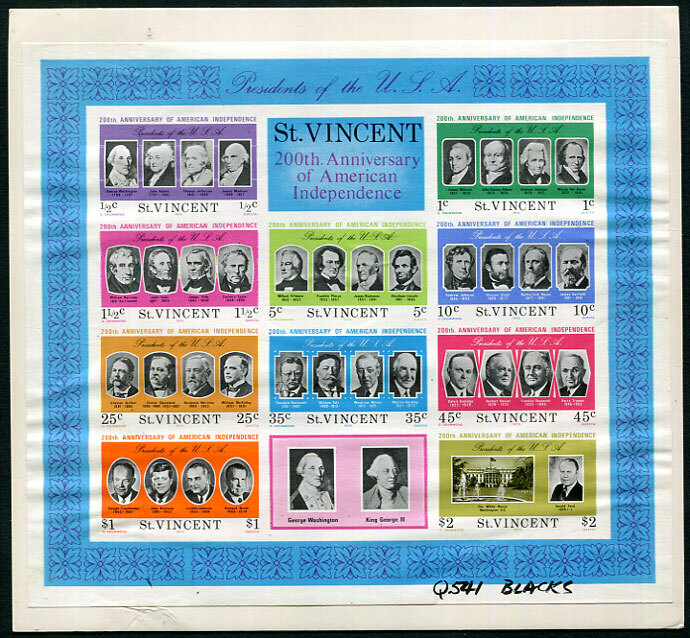 The other transposed Presidents error sheet, also mounted by the printers on white card, has lighter black backgrounds behind portraits of the Presidents than found on issued stamps. This sheet is uniquely marked "Q541 BLACKS" in lower selvedge being the House of Questa printers reference number presumed connected with the black printing. 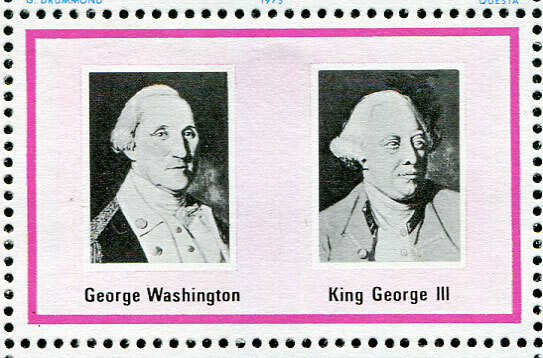 The error was noted after completion of printing with ALL SHEETS DESTROYED by the Crown Agents and printers, and the corrected printing sent to St. Vincent (the two error sheets accepted by O.J. 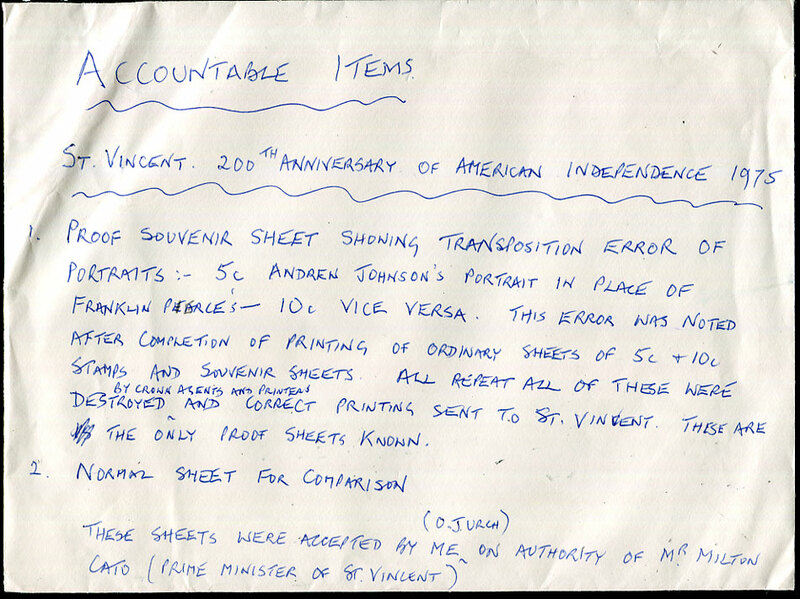 Urch, philatelic adviser, from Prime minister of St. Vincent Milton Cato per "accountable items" original envelope which is enclosed).